Have humans been sharing the planet with other intelligent life for millions of years without realizing it? 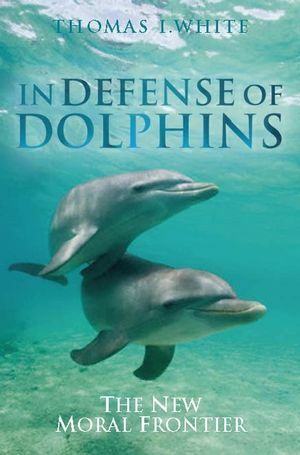 In Defense of Dolphins combines accessible science and philosophy, surveying the latest research on dolphin intelligence and social behavior, to advocate for their ethical treatment. Thomas I. White, Ph.D. is the Hilton Professor of Business Ethics and Director of the Center for Ethics and Business at Loyola Marymount University in Los Angeles, California. He is also the Scientific Advisor to the Wild Dolphin Project in Jupiter, Florida. He received his Ph.D. in Philosophy from Columbia University in 1974, and he taught at Upsala College and Rider University in New Jersey before moving to California. In addition to numerous scholarly articles on a variety of philosophical topics, he is the author of Right and Wrong, Discovering Philosophy, Business Ethics and Men and Women at Work (with Katherine Kearney). Since 1990, he has observed and assisted with the research of Dr. Denise Herzing of the Wild Dolphin Project, a marine scientist who has been studying a community of wild Atlantic spotted dolphins in the Bahamas for more than 20 years. Prologue: Why does a philosopher study dolphins?. 1. Dolphins: The Philosophical Questions. 2. The Anatomy and Physiology of Living in the Water. 3. Do Dolphins Think and Feel?. 4. Can Dolphins Solve Problems and Understand Language?. 6. What Kind of Beings are Dolphins?. 7. Ethics and Human/Dolphin Contact. "Thought-provoking … very readable and well laid out … (White) raises some important issues regarding the way we view other species."